JOINT BASE MCGUIRE-DIX-LAKEHURST, N.J., (Army News Service, June 15, 2011) -- One of the Army Reserve’s top priorities is taking care of its Soldiers’ families, but that altruistic approach often extends beyond the boundaries of family, service, and even nation. Several active and retired Soldiers from the 99th RSC and other Army Reserve units are giving young adults from around the world the opportunity to live in and learn about the United States through a student-exchange program. Harrington’s latest exchange student was coordinated through Ayusa International, which was founded as a non-profit organization in 1981 in San Francisco. In 1985, the Study Abroad programs were launched, giving American students the opportunity to travel to Japan and Western Europe for education. In 1999, the Ayusa program began operating under the auspices of the Department of State’s Bureau of Education and Cultural Affairs. Ayusa currently has offices around the world and has connected host families with exchange students and provided study abroad programs and volunteer opportunities for more than 60,000 participants since its inception. Harrington has hosted five exchange students over the years. Her first came in 1998, after curiosity and an Internet search led her to an international student exchange program. In 2011, Harrington, along with her husband and children, hosted Seina for her sophomore year of high school. Seina, a native of China, came to the U.S. through Ayusa’s Tokyo office, said Harrington, and has enjoyed an experience she might not otherwise have had. Chief Warrant Officer 5 Stanley Slinker, a member of the 244th Aviation Command, hosted Julia, a junior from Germany, this year. As part of her program agreement, Julia was encouraged to meet a member of her host country’s government. Germany’s parliament, the Bundestag, is equivalent to the U.S. Congress, said Harrington. Julia asked to meet Rep. Jon Runyan, whose 3rd District includes Joint Base McGuire-Dix-Lakehurst, in order to learn more about U.S. politics and the way the government works. 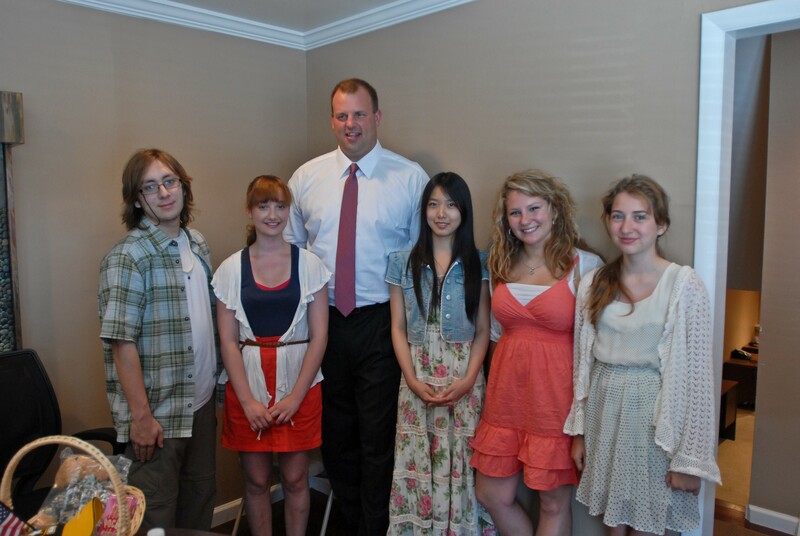 Julia, along with Seina and Vanessa, a junior from the Ukraine, and Harrington’s two children visited Runyan at his Mount Laurel office June 8, 2011. The exchange students brought the congressman a small basket of items from their home countries and shyly asked him about his experiences as a government official and as an American. Runyan spoke about his time as a player in the National Football League and explained how the transition from the football field to the House of Representatives was an easy one. “Some of the skills that are important as a member of a football team -- being able to work as a team, showing good leadership, thinking creatively -- translate really well into my job now as a congressman,” he said. While the students certainly benefit from the time in their host family’s country, the host families also get to enjoy learning about a different culture, said Harrington. Host families are not paid for hosting, although they are eligible to claim a $50 tax credit for every month they have an exchange student. The students bring their own spending money and have their own medical insurance. Host families are expected to provide meals, transportation as needed and a safe home environment. For more information on the Ayusa’s foreign exchange or study abroad programs, visit http://www.ayusa.org/.